Small to Large Companies face a number of important challenges when it comes to the protection of their virtual servers and critical business data. 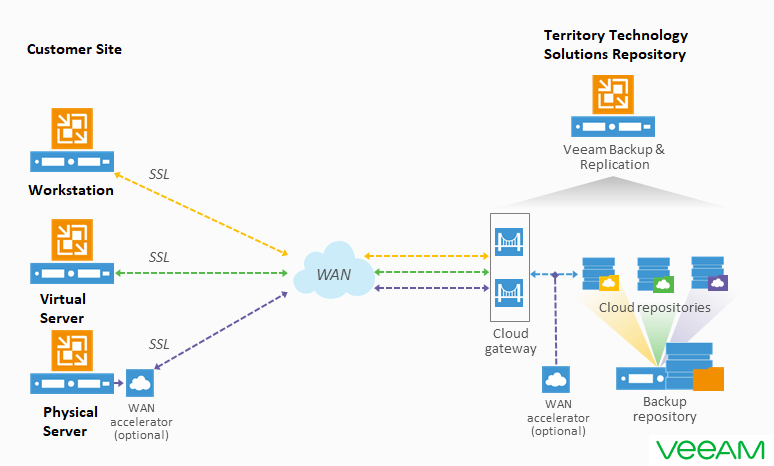 Territory Technology Solutions & Veeam provide agentless backup and disaster recovery for virtualised and physical environments using Veeam Backup & Recovery paired with Veeam Cloud Connect. vBackup delivers powerful and reliable features and functionality to help you avoid the risk of catastrophic data loss powered by Veeam, the industry leader in backup and restore technologies. Manual backups are obsolete technology, tapes are simply too expensive, difficult and impractical to maintain secure backup processes for local, remote and archival data protection or disaster recovery. And these problems are further compounded by the complexity of a virtualised architecture. The vBackup service provides fast, flexible, and reliable recovery of virtualised systems, applications and data. It unifies local on-site backup and off-site cloud replication in a single hybrid solution; increasing the value of backup for VMware, Microsoft Hyper-V virtual environments and Physical Servers / Workstations. The number one VM backup solution from Veeam now Avaialble from Territory Technology Solutions as a per month subsscription. Eliminate the complexity of managing backups for each individual guest server by protecting all VMs from the hypervisor level. From one console, you can protect VMware vSphere, Microsoft Hyper-V and Physical Servers. Territory Technology Solutions provide access to VMs directly from a compressed and duplicated backup file on regular backup storage with offsite replication for complete recovery, even if the onsite backup appliance is destroyed. For more information call our sales team at Territory Technology Solutions on (08) 8944 2222 or email us at sales@techsolutions.com.au.